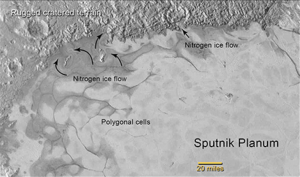 Atmospheric Escape and Flowing N2 Ice Glaciers – What Resupplies Pluto’s Nitrogen? 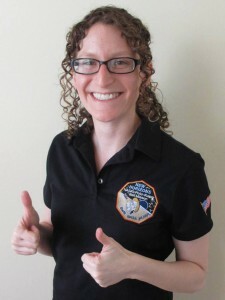 Hi, I’m Kelsi Singer, a postdoctoral researcher at the Southwest Research Institute, working on NASA’s New Horizons mission and specializing in geology and geophysics. One of my areas of expertise is impact cratering. That subject may not seem related to Pluto’s atmosphere or nitrogen at first, but let me tell you about research that New Horizons principal investigator Alan Stern and I conducted and published as a prediction paper before the flyby of Pluto. 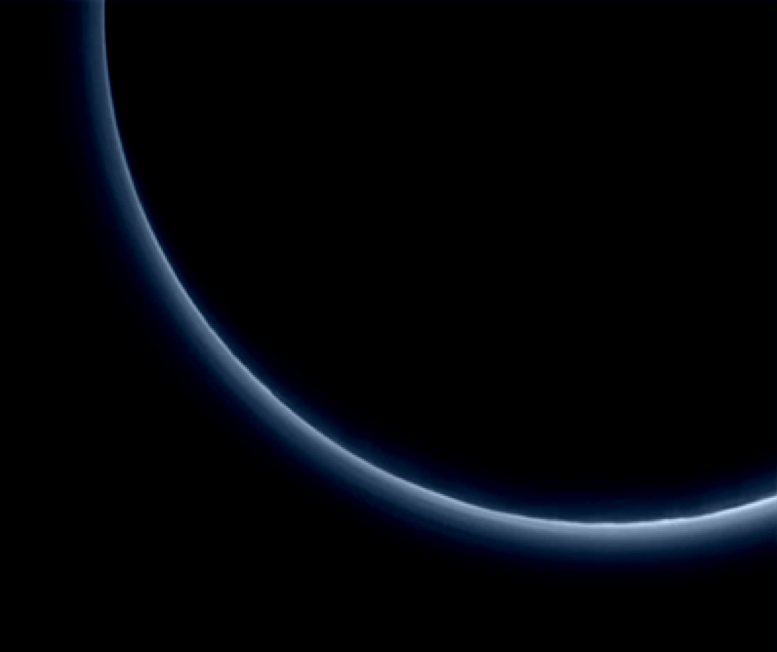 New Horizons has returned striking images of both Pluto’s surface and its atmosphere. Pluto’s atmosphere is similar to Earth’s in that it is predominantly composed of nitrogen (N). But Pluto’s atmosphere is ~98% N, while Earth’s is only ~78% N. Pluto’s atmosphere is also considerably thinner than Earth’s with ~10,000 times lower pressure at the surface. The nitrogen in Pluto’s atmosphere (in the form of N2 gas) is actually flowing away and escaping the planet at an estimated rate of hundreds of tons per hour. We also see what looks like flowing ice on Pluto’s surface in high resolution images made by New Horizons. The water ice (H2O) that we are familiar with on Earth would be completely rigid and stiff at Pluto’s surface temperatures, but ice made out of N2 would be able to flow like a glacier. So where does all of this nitrogen come from? 1) Could comets hitting Pluto directly deliver enough N to Pluto’s surface and atmosphere? 2) Could these comets excavate or expose enough N2 ice from the near-surface layers on Pluto by forming impact craters? —> The short answer is that none of these cratering effects seem like they could supply enough nitrogen. In our prediction paper, we suggested the next most likely suspect for supplying this N is heat and geologic activity inside Pluto itself. 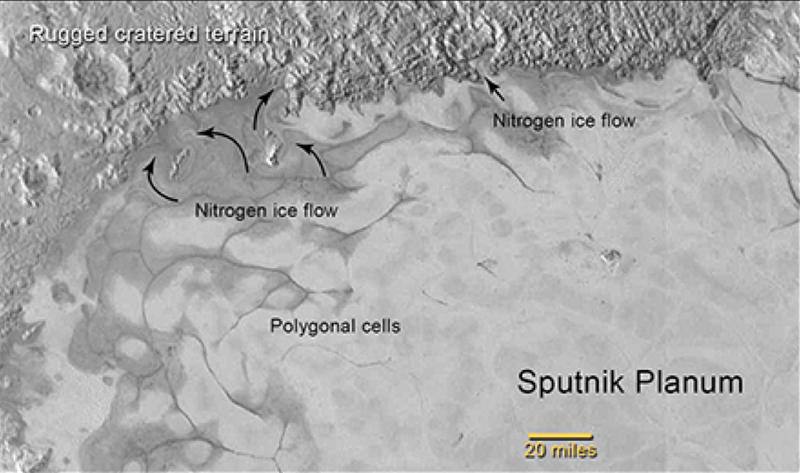 This activity could process nitrogen out of Pluto’s rocky interior and get it to the surface. We currently have only a tiny fraction of the data back from the New Horizons flyby, but the fact that there are young-looking areas on Pluto hints at relatively recent geologic activity. Stay tuned as we get more data back from the New Horizons spacecraft over the coming months, which will refine our estimates of Pluto’s atmospheric escape and provide more images of Pluto’s surface to assess the types and timing of geologic activity.